Haitian businessman Jovenel Moise addresses the audience after being declared winner of the November 2016 presidential elections, in Port-au-Prince, Jan. 3, 2017. The man poised to become Haiti’s president on February 7 draws a parallel between himself and the new chief executive of the United States, suggesting his desire to forge a personal bond between Port-au-Prince and Washington. Like Donald Trump, Jovenel Moïse has a resume steeped in business, but no previous experience in public office. A successful banana exporter, Moïse earlier helped create a regional power company and ran a water distribution plant, among other pursuits. "President Trump and I are entrepreneurs, and all an entrepreneur wants is results,” Moïse said in an interview last week with the Reuters news agency. “And therefore I hope we'll put everything in place to make sure we deliver for our peoples." But the Haitian businessman, 48, faces lingering suspicions related to his financial dealings. Late last month, he spent four hours in a closed Port-au-Prince courtroom answering questions about purported money laundering. He has denied the allegation, claiming it’s politically motivated. Moïse’s opponents are pressing for a decision by inauguration day on whether formal charges should be brought. Supporters of presidential candidate Maryse Narcisse, from the Lavalas party, step on a campaign poster of presidential candidate Jovenel Moise, as they protest election results in Petion-Ville, Haiti, Nov. 12, 2015. This Caribbean nation of 11 million people has suffered a protracted election cycle. A first round of voting in 2015, was nullified after allegations of fraud. A second round, set for last October, was delayed after Hurricane Matthew struck, killing at least 1,000 people. Haiti was still struggling to recover from a massive 2010 earthquake that left at least 200,000 dead and the capital city in ruins. Moïse, handpicked by former President Michel Martelly to represent his change-oriented Haiti Bald Headed Party, won nearly 56 percent of the November vote. Interim President Jocelerme Privert has led Haiti since Martelly’s five-year term ended a year ago. Moïse has said as president he would govern inclusively. “We have to work together,” he told VOA in an interview in Haiti’s capital on the eve of his election victory. Then Republican presidential candidate Donald Trump listens to a question during a campaign event at Little Haiti Cultural Center, Sept. 16, 2016, in Miami. The United States is the biggest benefactor to Haiti, the Western Hemisphere’s poorest country. It had disbursed $3.9 billion in post-quake aid as of September 30, 2016, the State Department told VOA. The amount includes $2.5 billion in reconstruction and development spending. The new U.S. president has said his administration will scrutinize all foreign aid commitments. 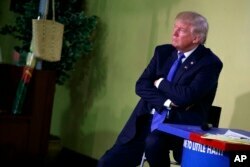 As a candidate, Trump criticized some aid spending in Haiti, alleging certain contracts benefited the family foundation and friends of his Democratic rival, Hillary Clinton, including while she served as secretary of state. The Clintons, including Bill Clinton, who as president ordered U.S. troops to Haiti in 1994 to return democratically elected Jean Bertrand Aristide to power after a military coup, denied any wrongdoing. Bill Clinton later served as a U.N. special envoy to Haiti. The Associated Press reported that the State Department found no evidence of preferential treatment or contracts. 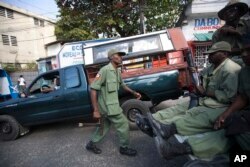 Armed, former members of Haiti's disbanded army patrol the streets while simultaneous pro- and anti-government protests take place in Port-au-Prince, Haiti, Feb. 5, 2016. Moïse told VOA he wants to resurrect a standing army, which Aristide disbanded upon returning to Haiti. But he acknowledged there’s no budget for an army in Haiti, where U.N. peacekeepers supplement civilian police in providing security. State Department special coordinator for Haiti Kenneth Merten told VOA the United States wouldn’t support a Haitian army, with its history of coups d’etat. “We’ve spent a lot of money so Haiti could have a police force that is competent and transparent,” Merten says. Moïse campaigned on economic expansion, saying Haiti would “use the people, the sun, the land and water.” The president-elect wants to improve agriculture and develop more tourism. “Haiti should have four or five tourist destinations, just like the Dominican Republic,” he told VOA. Pierre Marie Boisson, chief economist of Haiti’s Sogebank Group, predicted that installing a democratically elected president and filling vacant parliamentary seats would improve the economy and inspire broader confidence in the country’s prospects. "We must expect a booming economy" in 2018, Boisson told VOA. He said the growth would be led in part by the apparel industry, which employs tens of thousands in Haiti. Some Haitians have fled their impoverished country, including thousands massing just south of the U.S.-Mexico border while seeking entry to the United States. After the 2010 quake in Haiti, the United States granted asylum-seekers temporary work permits and shielded them from deportation. That changed in September, with the Department of Homeland Security announcing renewed strict enforcement in light of Haiti’s improving economy. VOA Creole Service’s Jacquelin Belizaire and Jean-Pierre Leroy contributed to this report, which was updated Feb. 7 to adjust the amount of U.S. aid to Haiti. The story previously said U.S. post-quake aid to Haiti exceeded $3.2 billion.